Sponsors of How to Double Your Profits in Six Months—Guaranteed! The following companies are sponsoring the Cleaning and Restoration Institute's How to Double Your Profits in Six Months—Guaranteed seminar to help provide and give back to our industry information and educational services to help you be all that you can. Satisfied customers lead to repeat business...and more customers! Because Teflon® Advanced keeps your customer's carpets looking cleaner longer, their satisfaction with your cleaning will increase and so will your repeat business and referrals to friends and relatives. Nothing helps a business to grow faster than quality products and word-of-mouth advertising. Recent surveys show that 95% of customers are satisfied with the performance of Teflon®. Our pledge is uncompromising customer service in the pursuit of excellence. We are committed to quality education and the most effective technology in our Industry. We promise that our staff will always be positive, friendly and helpful. No effort is too big and there is no such thing as a small customer. MasterBlend is one of the most innovative manufacturers of chemicals and equipment on the market today. They recently developed the ResponsibleCare System of anti-allergen cleaning and treatment products that is sweeping the country and opening a huge new market to carpet cleaners interested in mattress cleaning and other anti-allergen cleaning services. They also have a wide variety of specialty chemicals such as solvent-based upholstery protectors with very low odor and with UV protection, Fine Fabric Pre-Spray, which is a wet and dry clean upholstery pre-spray as well as a powerful traffic lane cleaner booster and many more. They also offer the TruckForce line of portable extractors that have the power necessary to clean where truck mounts can’t go as well as to clean tile and stone flooring. The Bridgepoint Cleaning Network is designed to give you a competitive edge in a very competitive market. It focuses on education and marketing. The Network offers the education you need to run a carpet cleaning business, as well as the technical side of the business. We also offer marketing materials that no individual cleaning company could reasonably produce alone. Spotting Solutions, Inc. manufactures five carpet spot removers that allow professional carpet cleaners to take advantage of the multi-billion dollar market in retail carpet spotters. This way carpet cleaners can have all the marketing benefits of give-away spotters but get extremely well paid for it at the same time! There are five highly effective and yet simple to use carpet spot removers for the five common types of household spots and spills so consumers can choose the right products for their lifestyle and have them on hand to take care of spots and spills as soon as they happen. Spotting Solutions, Inc. is a strong supporter of the cleaning industry and sells its products through a nationwide network of professional carpet cleaner dealers. Indoor Health and Comfort is a supplier of chemicals, equipment and supplies exclusively for the professional carpet cleaner and restoration contractor. Our philosophy is simple, "if we help you be more successful, we'll be more successful, too!" How do we help you be more successful? We offer free freight on practically everything we sell! There are no minimum orders or other conditions. Think about what you could do with all the money you paid in shipping costs over the past year! We also offer an exclusive Buyer's Club Rebate on all chemical purchases of up to 10%! When's the last time you heard of a distributor sending you a check each month! That's right, when you join our Buyer's Club, we'll send you a rebate check each month on all your chemical purchases. And that's money that can really add up! We represent innovative companies with new and exciting products and programs as well as a wide variety of chemicals, equipment and supplies for new services rapidly being added by professional carpet cleaners such as mattress and anti-allergy cleaning, tile and grout cleaning, stone and marble care, wood floor maintenance as well as some innovative resale programs specifically for carpet cleaners. Visit us at www.goihc.com or call toll free 866-846-1444. Founded in 1962, the company's cleaning service has 55,000 residential and commercial customers in central Indiana and supplies thousands of professional cleaners on five continents with equipment, cleaning agents and supplies. Bane-Clene® Institute and its referral network are used by leading carpet makers and more than 5 million consumers logged onto www.baneclene.com in the past year. ProTeam’s full line of lightweight, powerful backpack vacuums are the first to receive the Carpet & Rug Institute’s green label for soil removal, filtration efficiency and carpet appearance retention on commercial carpet. No other backpack vacuum compares to ProTeam’s quality, durability or innovation. And now, ProTeam is carrying its vacuum expertise into an ever-expanding line of high-end vacuums. There is no better carpet cleaning software to help run your carpet cleaning business more efficiently then ServiceCEO. Our proven track record, powerful feature functionality, and commitment to our product, is why more and more carpet cleaning business owners are choosing ServiceCEO. ServiceCEO offers all the features and tools you'll need to operate and grow your business with greater ease and organization. It's one business management software solution that does it all. Easily manage and track your customers, jobs and schedules. Invoice and bill your clients without hassles. And, instantly answer your customers' or employees' questions in seconds with accurate information at your fingertips. When it comes to carpet cleaning software, ServiceCEO has the features to save you time and money. Inside Edge Commercial Interior Services is an independent, flooring service company that provides installation, project management and maintenance services to multi-location customers throughout the U.S. We utilize a network of pre-qualified service providers to deliver superior service using the most advanced cleaning chemistry and methodology. Our goal is to increase the level of service and reduce cost for national account customers. Competition-Free Marketing is for cleaners who take pride in what they do. This program solves the problem of finding the customers willing to pay extra for quality workmanship and customer service. Steve Marsh, the creator of this program, has personally serviced these quality-seeking customers for over 30 years. He has the necessary expertise to shape your business to appeal to those consumers. This is not a �marketing miracle�, but a logical step-by-step approach to building a solid and profitable clientele. All of the marketing, follow-up and printed materials you need are professionally designed and customized for your business. Multi-Sprayer provides a variety of high quality, extremely durable spraying tools designed to make a carpet cleaner/restoration contractor’s job faster, more efficient and more effective. They offer a sprayer for virtually every purpose and their cordless sprayer is perhaps the ideal all around sprayer for professional carpet cleaners, offering viton seals for use in virtually any cleaning operation without being limited by electric cords. And the sprayer simply plugs into the van’s cigarette lighter between jobs to maintain a constant charge. There’s never any downtime to recharge! Founded in 1972, Unsmoke Systems carries on a long tradition of odor control and mold remediation excellence. Originally a service firm performing the removal and neutralizing of odor problems resulting from: Fire-related smoke, water damage, death and decomposition, animal urine, etc. Unsmoke was the first company to offer a “written guarantee” on odor removal work. 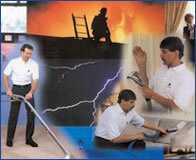 Your source of information on the carpet cleaning & restoration industries. Rotovac Corporation is the manufacturer of the Rotovac PowerWand. The Rotovac PowerWand uses patented vacuum heads which outclean all other cleaning systems, cleaning carpet fiber from all directions while gliding over the carpet in one effortless motion. We also feature a great home business opportunity for self employment in a business start-up kit that includes all the carpet cleaning equipment you will need to get started, including a carpet cleaning extractor and the patented Rotovac Powerwand, all at our guaranteed lowest price!